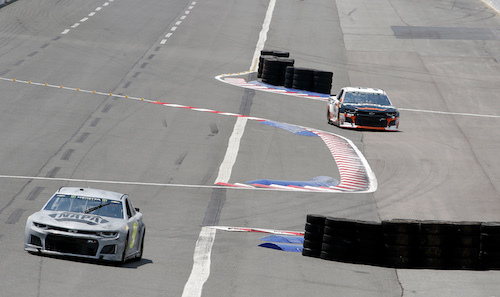 Sixteen Monster Energy NASCAR Cup Series drivers tested the latest, and expected final, incarnation of the Charlotte Motor Speedway roval, a road-course/oval hybrid, Tuesday. The other half of the full-time Cup Series drivers are expected to test the course July 17. While the course didn’t change during the latest test, NASCAR had to take measure to keep drivers on the intended course. Early in the session, drivers tried to take a shortcut through a backstretch chicane, but NASCAR put a stop to that by halting the session for two hours to install two more rumble strips and a tire barrier. Among the drivers testing Tuesday, the consensus prediction for the Sept. 30 running of the Bank of America Roval 400 was little passing and high attrition. The Bank of America Roval 400 will be the elimination race in the first round of the 2018 playoffs.